Hva mer kan vi be om? Titleist har en dominerende posisjon på golfballmarkedet. Selskapet ligger ikke på latsiden. Det kommer stadig forbedringer. I fjor kom nye ProV1 og ProV1x. Golfsiden har hatt gleden av å teste dem gjennom fjoråret. Den største nyheten var kanskje at de var mer holdbare enn de gamle. Det gir bedre ball-økonomi for disse ballene som er så populære - spesielt blant tour-spillere og gode amatører. Men også ikke fullt så gode amatører har glede av å spille med disse ballene. Ikke rart at de dominerer balltellingen på tourene rundt om i verden. Sistnevnte gruppe bør nok vurdere New NXT Tour, NXT Tour S og Velocity Golf Baller. Det er disse som nå presenteres fra Titleist. Dette er baller som holder godt, går langt og er mer følsomme enn tidligere. Ballene passer for de fleste og bør prøves når man skal velge hvilken ball man skal spille på. 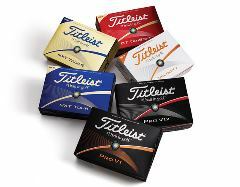 FAIRHAVEN, Mass (Jan. 27, 2016) – Titleist, the #1 ball in golf, delivers best-in-class performance in its new NXT Tour, NXT Tour S and Velocity golf balls for 2016 through new core and cover innovations. New NXT Tour has been engineered for even longer distance, while new NXT Tour S offers its softest feel yet. New Velocity provides even more powerful distance with a more playable feel. Every new Titleist golf ball model results from a rigorous R&D process rooted in golfer research and feedback, technological advancements, intellectual property leadership and comprehensive prototype testing and validation. Titleist’s precision manufacturing process ensures each new model delivers the superior performance, consistency and quality that golfers expect from Titleist. • New NXT Tour has a larger center dual core that produces low spin and fast ball speed for even longer driver and iron distance. The new core technology combines with Titleist’s soft, proprietary Fusablend cover for excellent shot stopping control and soft feel. • New NXT Tour S provides similar high performance benefits as NXT Tour with a remarkably softer feel. A reformulated softer compression core combines with a softer Fusablend cover to produce the softest-feeling NXT Tour S yet, while maintaining outstanding distance in the long game and commanding scoring performance for precision in the short game. • Comparatively, NXT Tour delivers longer distance with a higher flight, while NXT Tour S provides significantly softer feel. • Velocity’s proprietary LSX core technology delivers faster ball speeds for more distance on all full swing shots. The low-spin construction with leading-edge aerodynamics produces a soaring trajectory for remarkable carry and roll, while a new, thinner NAZ2 cover provides more playable feel in the short game. More than 34,000 golfers from around the world participated in the white box testing and validation process for new NXT Tour, NXT Tour S and Velocity, with golfers receiving prototype golf balls for on-course evaluation. Player feedback was then gathered through Team Titleist and shared with Titleist R&D. All new models are available in golf shops worldwide beginning Jan. 27, 2016. Engineered for high performance and distance, new Titleist NXT Tour is designed using advanced multi-component technology to provide even longer distance with excellent scoring performance and soft feel. NXT Tour’s dual core has been reengineered with a larger center that lowers driver and iron spin while delivering fast ball speed for more distance. A soft, thin Fusablend cover, pioneered by Titleist R&D, maintains NXT Tour’s excellent scoring performance with shot stopping control into and around the green. A spherically tiled 302 octahedral dimple design with shallower edge angles delivers a higher ball flight (than NXT Tour S) with a deep downrange peak trajectory. Softer from core to cover, new Titleist NXT Tour S golf ball is designed for players seeking the tee-to-green performance of NXT Tour – outstanding distance, consistent flight and excellent short-game control – with a significantly softer compression feel. New NXT Tour S has been reengineered with an even softer compression core and softer Fusablend, resulting in the softest-feeling NXT Tour S ever. A spherically tiled 302 octahedral dimple design delivers a piercing and stable ball flight. NXT Tour S is available in both White and High Optic Yellow. Titleist R&D has reengineered the new Velocity golf ball to deliver even more explosive distance on all full swing shots while providing a more playable feel in the short game. New Velocity is designed with a larger, faster LSX core that produces higher ball speed for more distance. The low spin construction and 328 dimples in a spherically-tiled tetrahedral design deliver a soaring, penetrating ball flight that produces long carry distance with more rollout. A thinner NAZ2 cover combines with the larger core to deliver more playable greenside feel. Velocity is available in single (#1, 2, 3, 4) and double-digit (#00, 22, 77, 99) play numbers. The double-digit play numbers were selected based on their popularity among members of Team Titleist (www.titleist.com/teamtitleist).